Your kitchen and bathroom are probably the two most used rooms in your home. People spend a lot of time designing their kitchens, but many people get the idea in their heads that their bathroom should be purely functional: you use it for what it is meant to be used for, get in and out, and that’s it. But any room that you are going to be spending that much time in on a daily basis should be a comfortable, as well as well-designed place to be. 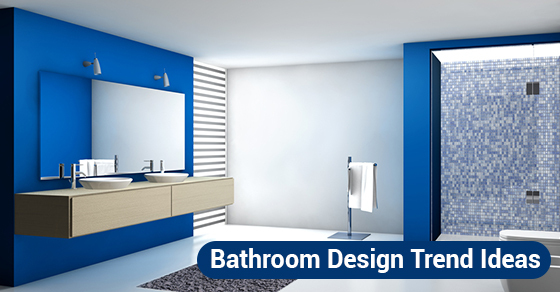 Below are four design trend ideas for your bathroom to make it just such as place. Zellige, cement and even terracotta tiles give bathrooms a rich, old-world vibe that will make you feel like you are in Tuscany or Sevilla. If you are worried that these options are going to be too pricy, consider half-height tiles for smaller bathrooms or powder rooms, or even just going for a small cement accent behind your sink. If you have a bathroom that is a bit on the modern side and you would like to add a touch of something classic to the mix, a vintage vanity is a great way to go. The mix of old and new is a bathroom trend that you are going to see more often in the future, so why not choose a vintage piece that not only looks great, but which serves a practical purpose as well. Going into a stark, all-white bathroom makes you feel like you are in an airport bathroom, and that is not inviting at all. Many new bathrooms are opting to go for darker, warmer colours that make the experience of being in the bathroom more calming and tranquil. Kitchen and bathroom designs in general are moving in this direction, resulting in increased peace of mind and contentment in your own home. This is in keeping with the “in with the old,” the new philosophy that seems to be sweeping interior design. In addition to the vintage style vanity mentioned above, another recent trend in kitchen and bathroom design is the return of vintage floor tiles. The great thing about these tiles, aside from the fact that they look fantastic, is that they are relatively inexpensive, and are built to stand up to constant use. If you are thinking about redoing your bathroom, or are planning a bathroom in a new space that you would like to update for the times, consider the above four bathroom trends and build a bathroom that is as comfortable as it is unique.